Created for prisons, military, jewelers, airports, banks, casinos and government offices. Mantraps are often manual swing doors forming a vestibule but they can also utilize automatic doors or gates. Two door mantraps are most common but systems can incorporate thirty or more doors when several controlled areas are interconnected. Clean rooms require clean air separation for a controlled environment. These air locks may also utilize air pressurization to maintain the sterile area. Some �air locks� use normally unlocked doors, however better systems will utilize doors that are normally locked with push button release stations on each. This insures that two or more doors cannot be opened simultaneously. Life safety codes may be involved when mantraps are used to limit ingress and egress. These will require that door interlock system be interfaced to the fire alarm control to allow an emergency door release. A local emergency pull station may be required to allow doors to be unlocked in non-fire alarm emergencies or to interface the mantrap system with NFPA 101 delayed egress controls. The most reliable systems provide for an independent door interlock controller to be separate from the computerized card access system for ease of service. The local building code agency should always be consulted before installation of the locking system. There are situations where no locks restricting an exit are permitted. In these systems only traffic lights are used to indicate when entry or exit is permitted. The #4300 series door interlock controller provides a high level of access control and an economical solution for 2-door systems. It can be configured on site to control two normally locked doors, two normally unlocked doors or a locked, unlocked pair. Only one door may be accessed at a time. A request for access or an open door inhibits the other door which remains secure until the first door is closed and no request is pending. Suitable for 2-door air locks or security mantraps, Both wet and dry output contacts are available for direct lock control and/or signaling requirements. Any access control system can be used with the 4300 series controllers. The request for access input recognizes any normally open dry contact. The door unlock sequence will follow the status of the request for access input unless the optional AT-timer is specified. Comes mounted in an enclosure with a 4 amp power supply. The 4300 is powered from the built-in 4 amp power supply which also provides 12 or 24 VDC to operate maglocks and/or strikes for each of the doors. The heavy-duty power supply is ready for hook-up to the fire alarm system. An alarm output is also provided for monitoring the control system. Enclosure- 12� x 16� x 4� deep NEMA enclosure will accommodate one or two relay modules with the built-in power supply. Additional modules may require larger enclosures. 4300 Module - 5� x 3� overal controls two doors. Electrical � AC Input - Fused 110 VAC DC Output - 4 amp field selectable 12 or 24 VDC Inputs � Two Dry Contact Inputs for Door Status (Contact closed when is door secure) Two Dry Contact Inputs for Request to Access (Contact normally open) Two Dry Contact Inputs for Remote Overrride Outputs � Two Relay Outputs - SPDT powered outputs for direct connection to locks. 3 Amps Max. Two Relay Outputs � SPDT dry contact rated for 3 Amps@ 28 VDC mirror lock status for traffic lights or signalling a remote console. Only one door may be unlocked or open at any time. Unlocking or opening one door automatically secures the other door of the designated area. A request for access at any normally locked door will inhibit the REX inputs for the other locked door or secure the other door if unlocked. Lock relay outputs are powered (12 or 24 VDC depending on supply) to switch low voltage power to maglocks and/or strikes. They may also power low voltage indicators such as LEDs to signal lock status for traffic control. Typically a green light indicates that access is permitted, and red signals that another door is open and access is denied until it has been secured. 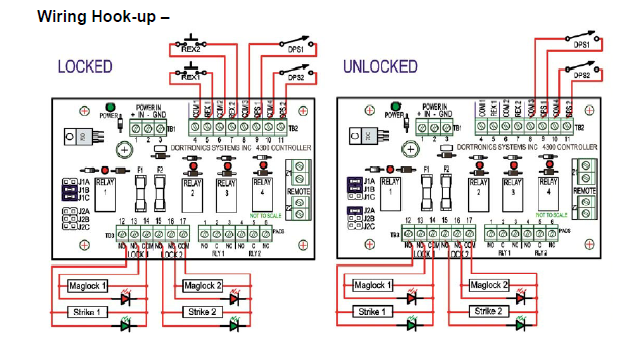 If special requirements such as indication of alarm conditions or custom timed operations are required, contact the factory for use of a 4700 series or 4900 series PLC based interlock controller.